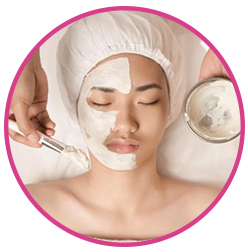 With a combination of lactic powder and kaolin, this mask will moisturize, clear, and calm your skin. Extremely effective in healing your skin after sunburn. Blue-green algae spirulina contains highly concentrated marine ingredients such as minerals, anti-oxidants, and vitamins. It absorbs the skin’s toxin and boosts its resistance, leaving the skin looking fresher and smoother and giving protection against free radicals that cause premature, light-induced aging. A special moisturizing fleece mask with natural collagen fibers that stimulate the skin’s natural functions and reduce fine lines and wrinkles while restoring its elasticity. 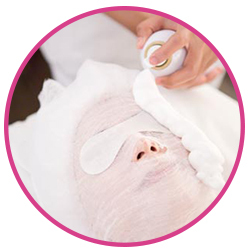 This treatment will intensively hydrate, calm, and firm your skin. A cooling peel-off mask to refresh and invigorate tired skin. Packed with algae extracts, this mask firms the skin while smoothing out fine lines and wrinkles for an intensively moisturized skin with a fresh, rosy glow . 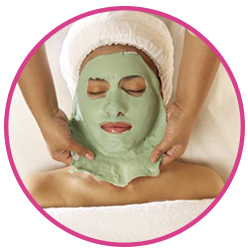 Give your skin a clean, clear, and balanced appearance with this green mineral clay mask. Containing valuable minerals and trace elements, this peel-off mask binds harmful substances and reduces sebum production and blemishes. This special combination of moisture lipid, algae extract, and lactic powder will stimulate the skin’s own mechanisms for the production of moisture and lipid. Effective and stable pure Vitamin C supports the skin’s natural collagen production and protects against environmentally-induced oxidative damage to the skin. Specially designed to improve the skin’s resiliency, HSR® lifting uses a multitude of innovative complexes to firm, tone, and lift. The skin becomes firmer and plumper with more elasticity, allowing the face to regain its youthful contours. Babor Luxurious ritual with rare active ingredients from the deep sea that includes anti-aging protein Glycocéane GP3, energetic BABOR thermophiles, and exclusive Green Caviar Algae Extract to form the Sea-telligent Complex will give you the ultimate anti-aging effects. Your skin will appear firmer, smoother, and more youthful. Well-known worldwide, very refreshing and revitalizing facial treatment, featuring a moisturizing and energizing algae-based mask with a Detox Effect. The skin looks instantly firmed and is provided with a long-lasting supply of highly-concentrated moisture. Clarte/purity : This treatment controls sebum gland effectively, reduces acne, and brings out fresh and moist skin. Hydration : A combination of hyaluronic acid and “extremely rare and exclusive” white truffle essence refreshes and enhances your skin moisture. Radiance : A luxurious mix of “24 carat of Gold extract” and red algae extract is the perfect combination to give your skin more radiance, softness, and suppleness. Anti-aging : Active ingredients of refined caviar essence and spirulina help reduce wrinkles effectively. Lift comfort : Precious oil of the black orchid combined with valuable macadamia nut oil helps the skin unwind and allows it to quickly regenerate. The skin is plumped from within, wrinkles are reduced, and the facial contours are resculpted. Maria Galland Signature well-being treatment for all skin types. 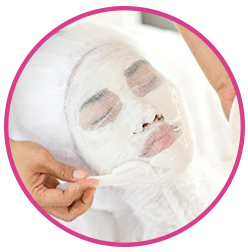 The wonderfully soft foam mask envelops the face like a cocoon. Its coconut oil from the “Warming Effect Foam Mask” allows extra attention to re-energize and gives your skin elasticity. Thanks to an exclusive massage ritual, this treatment offers the ultimate relaxation. Hydration : Feel immediate moisture sensation from a combination of hyaluronic acid and white truffle essence. Regeneration : Black orchid essence effectively protects your skin from negative environmental elements. Firming : Exclusive and refined Caviar essence is known for its firming effect. 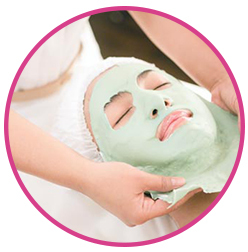 The warm mask sensation will deliver active ingredients well and refresh your skin. The power of “Mosaic System Treatment” combined with vitamins, minerals, and cell booster complex is known for its lifting effect. The warm sensation allows you to feel fresh, improve blood circulation, and develop long-lasting skin moisture. Hydration : The combination of hyaluronic acid and white truffle essence makes your skin more moist. Radiance : Combining “24 carat of gold extract” and Mosaic system treatment improves skin radiance. Anti-aging : Caviar essence is effective in reducing wrinkles while making skin firmer. Clarte : This treatment controls sebum gland effectively, reduces acne, and brings out fresh and moist skin. Lift Comfort : Precious oil of the black orchid with valuable macadamia nut oil helps skin unwind and allows it to quickly regenerate. The skin is plumped from within, wrinkles are reduced, and the facial contours re-sculpted. Stem Cell Regeneration : The combination of grape and Swiss apple stem cell provides skin nutrients and improves regeneration process. The algae and precursor complex are mixed together to create a serum with exceptional hydrating properties. 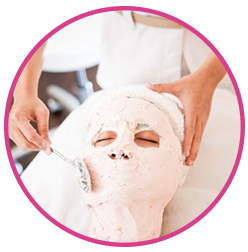 This luxurious treatment helps prevent fine lines from forming by keeping the skin hydrated and supple. Wrinkles are visibly reduced, and the skin is plumped. A premium 100% pure collagen with anti-aging properties: DNA and RNA to nourish and firm the complexion and restore youthfulness and skin vitality, leaving the skin firmed and plumped. This exclusive treatment combines the finest products and techniques to gently awaken the complexion’s glow and hue. An original creation from the House of Valmont, the Brightness of Ice treatment is devoted to fully restoring the complexion’s purity and youthful freshness, leaving your complexion fresh, serene, and glowing with beauty.